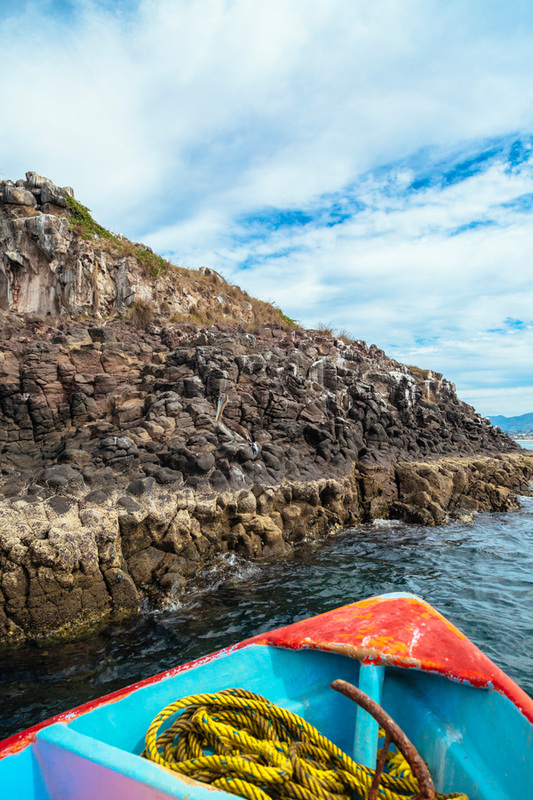 In the central part of the extensive tourist corridor of Riviera Nayarit, approximately 43.5 miles north of Puerto Vallarta, Rincón de Guayabitos is a sunny destination with an extensive bay of calm waters that, among other hidden gems, is home to the enigmatic Isla del Coral. Belonging to the historic municipality of Compostela, Nayarit, and located in the heart of Jaltemba Bay, this small but popular family resort is ideal for travelers looking for sun and beach. 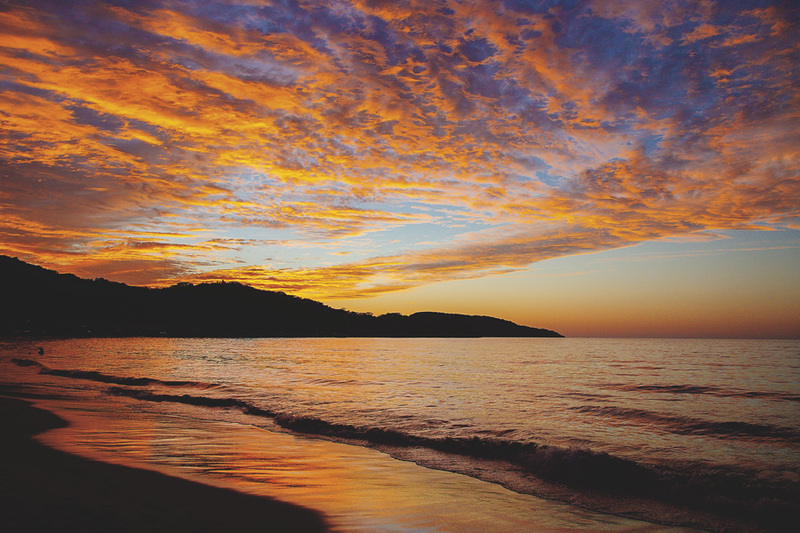 Rincón de Guayabitos is a quiet place, surrounded by nature, very vivid and full of activities and leisure options throughout the day, which pause only long enough for residents and visitors to admire the impressive sunsets that color the horizon. Attracted by these charms, the Vallarta Lifestyles editorial team embarked on a visit, which undoubtedly exceeded our expectations. We start our road trip 8:00am on a Saturday, taking the road toward Tepic. After just under an hour and a half on this road full of beautiful scenery, we arrive at Rincón de Guayabitos. Something curious and to keep in mind is that the time in this town is an hour earlier than the rest of its time zone. So, we had “more time” to enjoy the morning and breakfast before starting to explore the area. We park near the main avenue, with its hotels, shops and restaurants, as well as the striking church and the renovated main square with its flower boxes, benches and quiosco. 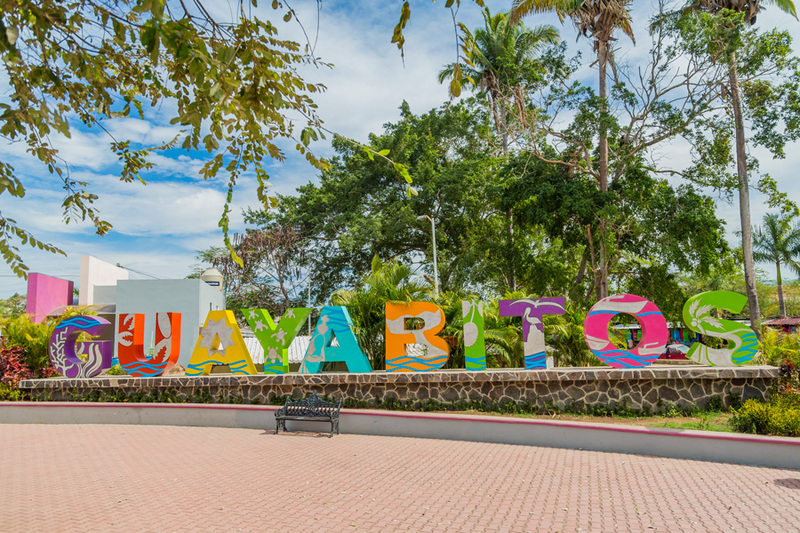 The square is the nerve center of Rincón de Guayabitos, serving as both a haven of peace and as a location for handicraft markets, concerts and other of the many social and cultural activities in this town. Be sure to take a selfie with the large-scale colorful letters in this plaza. Our walk continues toward the beach, along one of the wide pedestrian walkways that give access to the sea. The closer we get, the more we understand the appeal of this place, known as “the largest pool in the Pacific.” Certified Guayabitos Beach, about a mile and a quarter long and nearly 100 feet wide, is clean and perfect for walking, sunbathing, sports or just for children to build sand castles. On the other hand, its calm waters are ideal for a relaxing swim or water activities such as jet skiing, kayaking, SUP and sailing. On the horizon, nearly two miles from the coast, lie two sister islands—the smaller Isla del Cangrejo and the larger Isla del Coral—that form a protected nature reserve, thanks to community initiative, specifically the Rincón de Guayabitos Sociedad Cooperativa de Producción de Servicios Turísticos (Cooperative Society of the Production of Tourist Services), which also provides water transportation service and tours to the island. Another option is tour operators such as Pacific Bay Side, as they pick you up in the comfort of your hotel and transport you to the village, where the guided tour, visit to the island and food are included. Aboard one of these boats, we can see much of the natural wealth of this bay, which abounds with marine fauna and flora: colorful fish, starfish, stingrays and some peculiar crabs on the island named for them (humpback whales also can be seen during whale-watching season). Above, we are accompanied by numerous pelicans, seagulls and the curious blue-footed boobies, among other birds. As we approach the island’s pier, we are struck by the white sand beach bathed by crystal clear turquoise waters, a beautiful result of its location amid coral reefs. In addition to its incredible natural charm, the beach offers some services, such as a restaurant and security, making it an excellent place to have a good time. And the rocky formation of the beach makes its waters a natural aquarium, ideal for snorkeling and diving, allowing you to see some aquatic species, coral (which you are strictly prohibited from taking) and even the underwater statue of the Milagrosa Virgen de la Purísima Concepción (Miraculous Virgin of the Immaculate Conception), placed by the members of the cooperative and considered protector of fishermen, visitors and area mariners. After enjoying three hours of this natural wonder, we return to Rincón de Guayabitos for a second wind. Like the other coastal towns in the area, its varied gastronomic offering focuses on seafood and fish dishes, primarily pescado zarandeado and fish on a stick, in addition to several stalls with fresh fruit. Because of its tourism focus, there are also plenty of Mexican restaurants and international dishes available in town. To end this day full of unforgettable surprises, as the sun goes down we walk along the beach (where absolute tranquility has begun to reign) and take a prime seat to wait for the greatest natural spectacle of the bay: its sunset. An immense reddish-orange mantle takes over the horizon and reminds us that Rincón de Guayabitos has already earned a place in our hearts. Within Jaltemba Bay, you can also explore other places of interest, so if you have time, we recommend visiting Los Ayala and La Peñita. Los Ayala: A few minutes to the south, this is the ideal place to visit with your family. It is a small town that stands out for its more than half-mile-long beach, with calm waters, where children and adults can enjoy a Sunday full of games and beach activities, whether tanning, playing soccer, renting a jet ski or taking a banana ride. There are numerous restaurants very close to the beach, with their characteristic palapas, where you can enjoy some traditional ceviche or fish and shrimp on a stick. 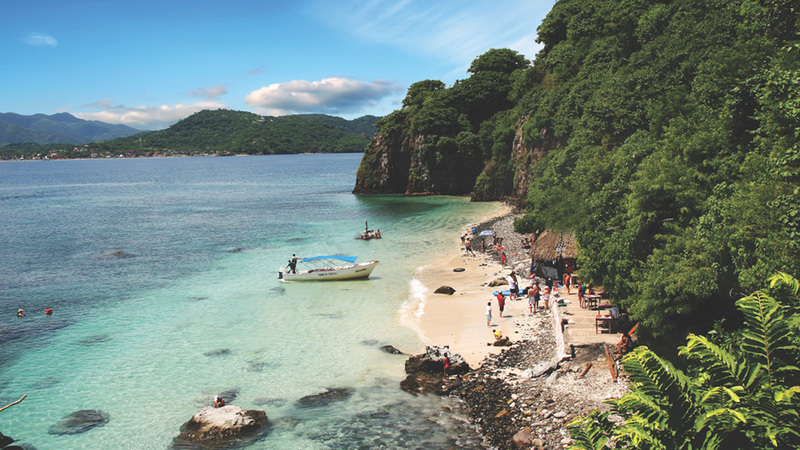 La Peñita de Jaltemba: Also just a short distance away, but to the north, this fishing village stands out for its postcard-perfect beach and sea, where pelicans rest on the pangas and fishing nets caress the shore. As in the two neighboring towns, in La Peñita you can stroll peacefully along its extensive beach admiring the two islands on the horizon or try some of the culinary delights prepared with fresh products from the sea.